In 1956, Gwendolyn Brooks created thirty-four poems that celebrated the joy, beauty, imagination, and freedom of childhood. 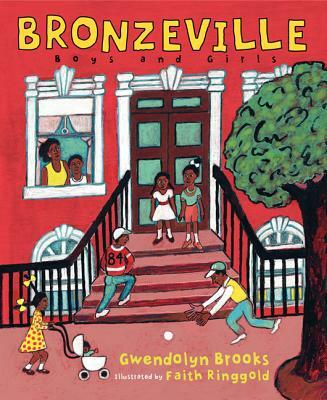 Bronzeville Boys and Girls features these timeless poems, which remind us that whether we live in the Bronzeville section of Chicago or any other neighborhood, childhood is universal in its richness of emotions and new experiences. An award-winning artist internationally renowned for her painted story quilts, Faith Ringgold is also the author of thirteen children's picture books, including the 1992 Caldecott Honor Award-winning Tar Beach. Her artwork is in the permanent collections of many museums, including the Studio Museum in Harlem, the Solomon R. Guggenheim Museum, the Metropolitan Museum of Art, and the Museum of Modern Art. She also has had exhibitions in major museums in the United States, Europe, South America, Asia, Africa, and the Middle East. She lives in Englewood, New Jersey, with her husband.